On 30 October 2018 BRECcIA held the first of its three country-level stakeholder workshops in Salima, Malawi. LEAD, along with Chancellor College, University of Malawi, organised and facilitated the workshop. Early Career Researchers for BRECcIA who travelled to Malawi to attend the workshop came from Kenya (Fiona Ngarachu and Daniel Naburi), Ghana (Moses Asamoah and Yaw Atiglo), and the University of Southampton (Matt Kandel). Stakeholders included members of government ministries, NGOs, media, and academia. One of the strengths of the Malawi stakeholder workshop was that presenters continually emphasized the co-design and co-production components of BRECcIA. In his introductory remarks, Dr Levis Eneya of Chancellor College underlined the participatory structure of the workshop, emphasising that ‘answering directly to the needs of the region’ is critical to BRECcIA. Prof Sosten Chiotha of LEAD followed Levis, reaffirming the points made about the importance of co-creation to BRECcIA. Sosten also mentioned some of the key takeaways of the UNDP-GCRF workshop that he, Prof Laura Lewis (University of Southampton), Prof John Obiri of MMUST (Kenya), and Dr Mawuli Dzodzomenyo (University of Ghana) attended in mid-October in New York. With direct application to BRECcIA, this included the importance of incorporating gender, governance, political economy, and political ecology approaches to research on climate change and food/water security. LEAD PDRA, Mathews Tsirizeni, followed Sosten with the first session of the day, ‘Introduction to BRECcIA’. Mathews outlined the aims and scope of BRECcIA, noting the collaborative and multidisciplinary framework of the project. After his presentation the stakeholders were then asked for their comments. Several questions centred on whether stakeholders will be engaged throughout the duration of the project; or, whether like most projects (something deemed less desirable), they are simply called on for the inception and dissemination phases. Stakeholders from media were especially adamant that they the need to be kept in-the-loop on such a large project given the technical/scientific nature of the research. Several other stakeholders expressed keen interest in the capacity development and interventions component to the project. One question raised was whether project intends to build the capacity of the farmers as well as the research institutions? A few others commented on what they considered to be project gaps with regard to private sector and youth engagement. The second session of the day, ‘Defining drylands and Identifying food and water security challenges in the drylands of Malawi’, was led by Levis. An interactive session, stakeholders were broken into four groups with at least one BRECcIA member also present. Large maps of Malawi were passed around and stakeholders marked where they considered the drylands of Malawi to be. Some of the most common areas included Nsanje district, Phalombe district, the Lake Chilwa area, and the Shire valley in Balaka district. After this exercise, we reconvened into one group and Levis asked stakeholders to define food and water security. A general consensus was that reliable access for all to affordable and nutritious food is critical. At the end of this session, the stakeholders completed a BRECcIA-designed questionnaire which sought to solicit more detailed information on their views with regard to drylands and water/food security. The intent here was that stakeholders’ responses would better inform the research and capacity development programme designs of BRECcIA. The third session, ‘Existing policy frameworks related to drylands, food and water security’, was led by Claire Bedelian (IIED) and Mathews Tsirezeni (LEAD). Also designed to be participatory, stakeholders were asked policy-relevant questions such as ‘What are the gaps in policy for addressing food/water security in the drylands?’, ‘What conflicts exist in various policies relating to the effective management of drylands?’, and ‘What is the level of implementation of the policies?’. Mathews provided a detailed water/food security policy review for Malawi, although Levis added that we should also consider acts of legislation—the Water and Resources Act being a good example. Stakeholders were then once again broken into groups and asked, among other things, to consider how BRECcIA research can address gaps in food/water security. It was clear from the session that the policy framework in Malawi does not explicitly integrate the ‘drylands’, a term that is not very well recognised in Malawi. Finally, Dr Mangani Katundu of Chancellor College led the ‘Research and research capacity gaps in water and food security’ session. This time stakeholders were broken into groups which were designed to match with BRECcIA Research Programmes (e.g. Capacity Building, Resilience and Interventions). The groups were asked to evaluate potential research questions for the project and identify research areas specific to the Malawian context. Upon the conclusion of this session, Eunice Shame of LEAD concluded the day’s workshop, requesting that all stakeholders write down what it is that they would most like BRECcIA to achieve. It was also agreed on how best to communicate with stakeholders moving on from the workshop. 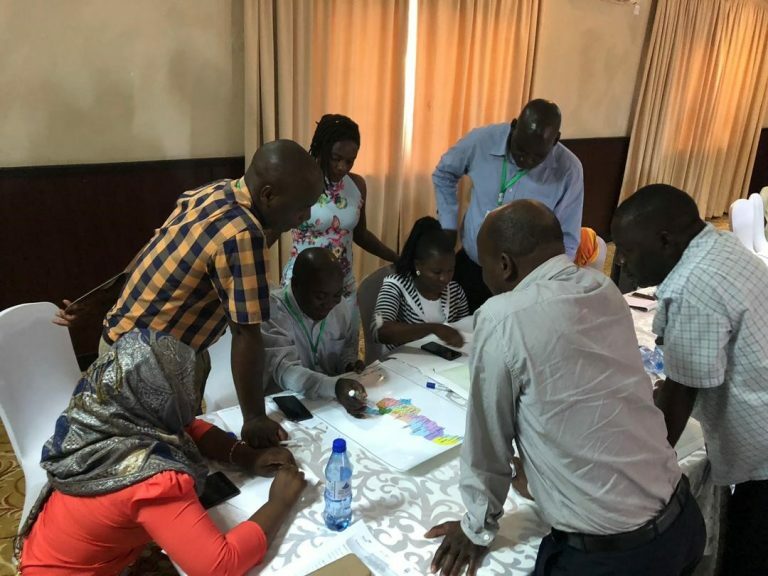 As the Ghanaian and Kenyan teams continue to organise for their national stakeholder workshops (November in Accra and January in Machakos, respectively), they will be able to draw on lessons from the Malawian workshop in their planning. BRECcIA looks forward to seeing in Ghana and Kenya the same type of high-level and sustained engagement that occurred at the Malawi stakeholder workshop in Salima. This entry was posted in Malawi, Stakeholders and tagged malawi, Stakeholders on 21st November 2018.